Lemony, citrus aroma, bright, floral. Tangy flavors in the beginning full of lemon and candied citrus, very appealing. Bright, fresh, big zesty zing! There is an excellent bitterness full of resinous pine, yet there is still a balance of malty sweetness in the background. A little nippy at the palate. Refreshing and very nice. My wife stole the glass from me about a third through and finished it. She brought the empty glass to the kitchen, stating "we went there (Victory Brewing)," to which I said "duh" to show my displeasure in her finishing my beer. 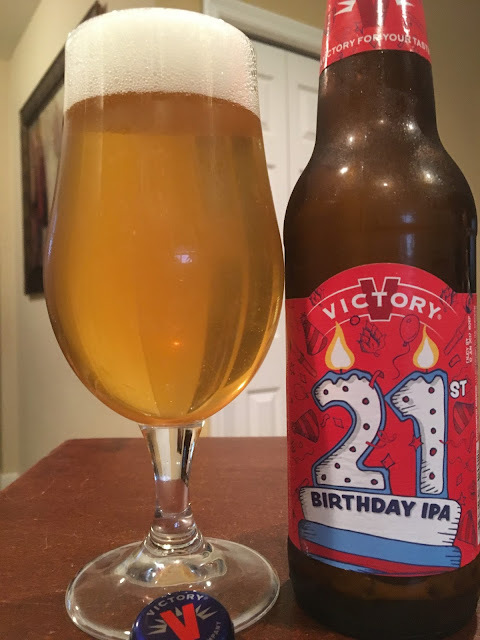 Check it out and Happy Anniversary, Victory Brewing!